Aikido of El Paso provides weapons training to individuals in the Southwest. Not only is weapons training useful for everyone studying aikido, but it is also an integral part of the art itself. Aikido techniques and footwork are in part predicated upon the use of these particular weapons. They can inform the body. Using the bokken and jo correctly means that the body’s biomechanics, posture, and alignment are strong and intact. Weapons are an aid to visualizing the centerline, essentially they become an extension of our hands. Students who partake in weapons training learn to control a partner’s center from their own center through them. Students also begin to learn how to manage distance more efficiently. The weapons of aikido teach to avoid pulling, forcing, or clashing. Aikido of El Paso continuously strives to train out students in the complete martial art. Training with weapons is essential when it comes to aikido. Although weapons classes are open to all, students are recommended to attend at least two non-weapons classes per week if they plan on partaking in weapons classes. The weapons of aikido guide students on a path towards acquiring certain skills that are very important in the martial art of aikido. Simply put, acquiring these skills without a weapon in hand is deemed too difficult. Aikido is focused on fast movements and balance. Weapons training allows for correct stance development in this regard. Weapons training also leads to an understanding of distance. When training with a partner, it can be difficult to define the optimum distance correctly. Weapons allow students to understand the right distance where they can control their training partners while not giving them a chance to strike. Weapons are also excellent tools to understand and develop better timing. Aikido training makes use of three principal types of weapons: bokken, jo, and tanto. The jo, bokken, and tanto respectively represent far, medium, and close distances. Each weapon serves a certain purpose. Bokken is a wooden model of the Japanese sword, the katana. Jo is a light wooden pole of about 50 inches in length. Its main application is for making direct blows and chop blows to both the body and the legs. Jo is also used to block attacks. Tanto is a Samurai dagger which can be used as a picking weapon. Aikido of El Paso also uses short staffs representing clubs, bats, and bottles which are more contemporary threats someone may encounter today. All weapons allow students to better understand the basic principles of aikido movements. Finally, the inclusion of weapons leads to more intense practice. It’s a great way for students to expand their aikido training. The use of weapons in aikido training helps to boost the student’s abilities. Weapons training also leads to more productive self defense methods. Aikido weapons are the foundation for understanding empty hands technique. Students learn katas, partnered practice, and weapons taking. Aikido of El Paso’s weapons classes are open to all students. 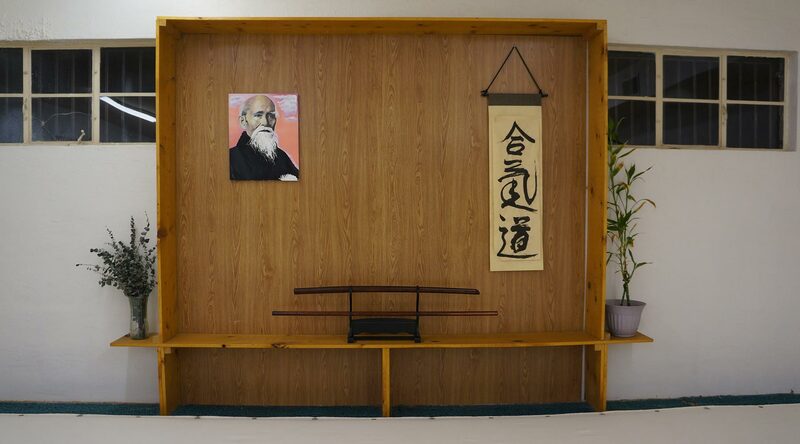 Visit our dojo today to experience the benefits of weapons training. Please fill the following form to sign up for our class or receive additional information about Aikido of El Paso.